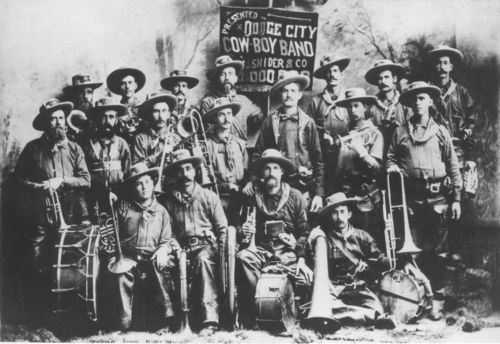 A studio portrait of the Dodge City Cowboy Band at the First National Convention of Cattlemen in St. Louis, Missouri. Pictured are: Back row: unknown, unknown, L.A. Lauber, J.S. Welsh, Charles Otero, unknown, Roy Drake; Middle row: Prof. Eastman, Prof. Miller, George [illegible], unknown, unknown, unknown, Frank Warren; Seated: Chalk Beeson, George Horder, William Visquesney.